Thank you for subscribing, sharing and for your contributions. 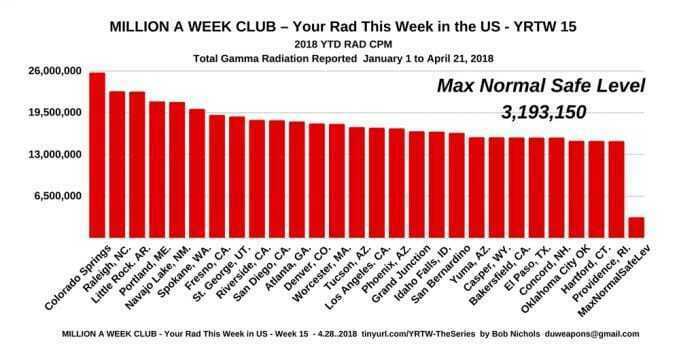 The United States is a very radioactive country. Since many readers of the Bob Nichols Veterans Today column view articles and reference earlier articles directly on the VT site and archives and because those links are apparently flagged on FB, for the time being, until these matters are resolved, alternate links will be provided and direct links will be referenced, but not hyperlinked. “WE ARE THE MEDIA NOW” So Be IT! KEEP IT SIMPLE. GET EMAIL UPDATES! WHEN I AM CENSORED, YOU ARE CENSORED. WHEN THEY ARE CENSORED, WE ARE CENSORED. BE ALARMED AT THE #VirtualBookBurnings taking place on FB and elsewhere, and BE ALARMING because WE ARE THE MEDIA NOW. See you on Pinterest? Lucy Occupy says… ‘Sun Tzu suggests that it’s best practice to use the enemy’s tools, fools and weapons! Do not #DeleteFacebook! #DodgeTheRads and #DodgeTheCensors….they’re everywhere! 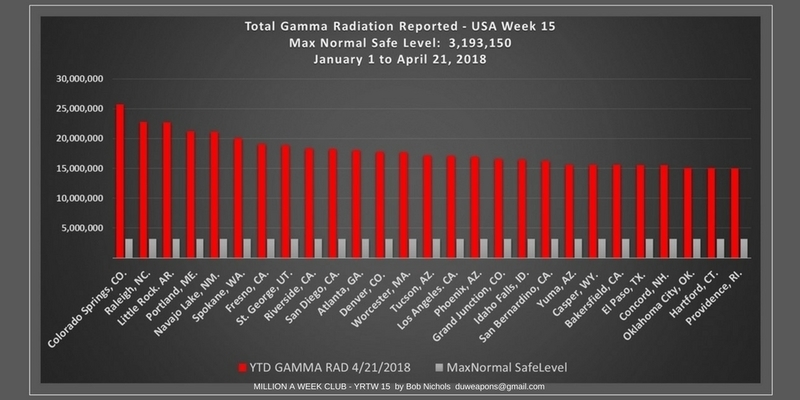 MILLION A WEEK CLUB – Total GAMMA Radiation USA – FOLLOW and SHARE THIS PINTEREST BOARD! 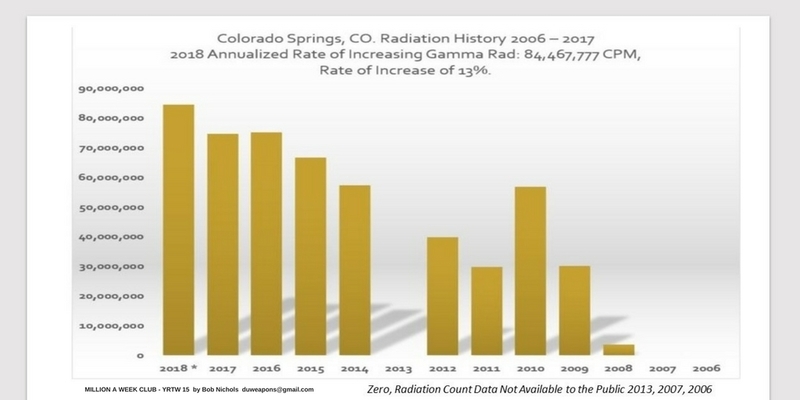 This entry was posted in "Facing a Dying Nation", Bob Nichols - MILLION A WEEK CLUB, Bob Nichols - Project Censored Award Winner - Veterans Today Columnist - and frequent contributor to various online publications, MILLION A WEEK CLUB - YRTW 15, Radiation Max Normal Safe Level, SPOTLIGHT ON COLORADO SPRINGS - Radiation History 2006 - 2017, TOTAL GAMMA RAD, Wigner Effect and Ionians and tagged #CensorshipInAmerica #CensoredInAmerica, Congrats BOB NICHOLS! Censored on FB for sharing free government data!, Do not #DeleteFacebook - #DownloadFacebookData, MILLION A WEEK CLUB videos - Your Radiation This Week YouTube and Vimeo channels, Million Count Cities, ProNukers Spread Death and Pestilence - Always. Connecting the Dots by Bob Nichols, Veterans Today Network - #CensoredInAmerica, Wigner Effect, Wigner Effect and Ionians. Bookmark the permalink. ← MILLION A WEEK CLUB – YRTW 11, 12, 13, 14 Subscribe today for email updates! Fight Censorship! #CensoredInAmerica –Congrats! BOB NICHOLS CENSORED ON FACEBOOK FOR PUBLISHING FREE GOVERNMENT DATA!